I’m not the first filmmaker to use Broken Hill as the staging ground for a statement about national identity. Wake in Fright, Mad Max and Priscilla all chose Broken Hill as a microcosm for Australia, with good reason. Broken Hill embodies the myth of the Real Australia. Its story is Australia’s story, a tale of luck, generosity and fear. 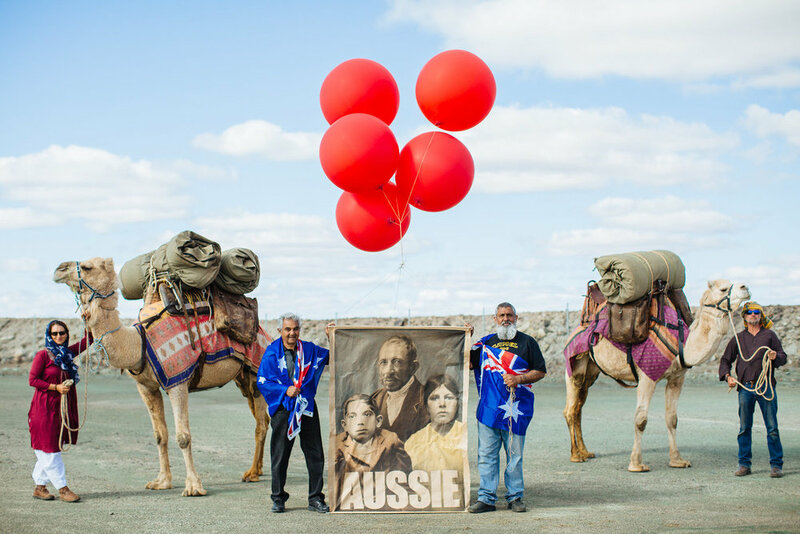 My mission in Broken Hill was to celebrate, amend and improve that myth, and in doing so reclaim Australian identity, just as Pricilla had done twenty two years ago. In 1883 the chance discovery of a $300 billion mineral deposit attracted sudden, mass migration to the arid lands of the Wiljakali people of remote NSW. Just like the gold fields, Broken Hill was distinctly multicultural and part of its mix were the Cameleers, because camels were the only animals that could meet the challenge of transporting goods in a desert continent. One of the most successful Cameleers of Broken Hill was Abdul Khalik. 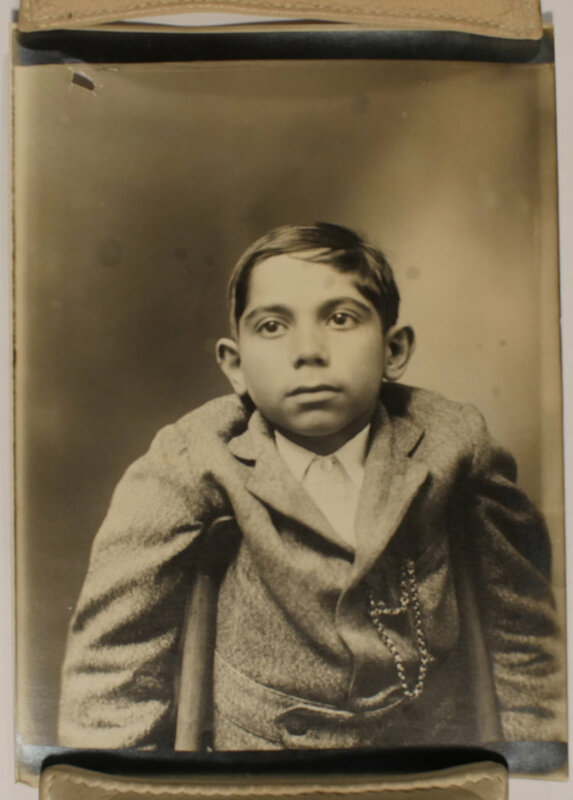 Born in Karachi, he was twenty years old when he arrived in South Australia in 1880 to work under contract to Elder, Smith & Co. He lived in Australia for 48 years with every opportunity to return to Karachi, he even visited a few times to bring his family to Australia. When he died in 1936 he owned 50 camels and the people of Alice Springs named Kharlic street after him. Surely Abdul Khalik was an Aussie! But Australia’s identity is as complicated as it’s history. During the White Australia Policy the cameleers were so important to Australia’s economy that they were granted special exemptions, allowing them to leave the country and return without racial exclusion. It was in the exemption records of the Australian National Archive that I found the ID photograph of Abdullah Khalik and his two children Abdullah and Wizaree. They had made their application so that the two Australian born children could travel with their father to Karachi and meet their stepbrothers. I like to imagine those two children on the street of Karachi in 1923, such a long way from home. 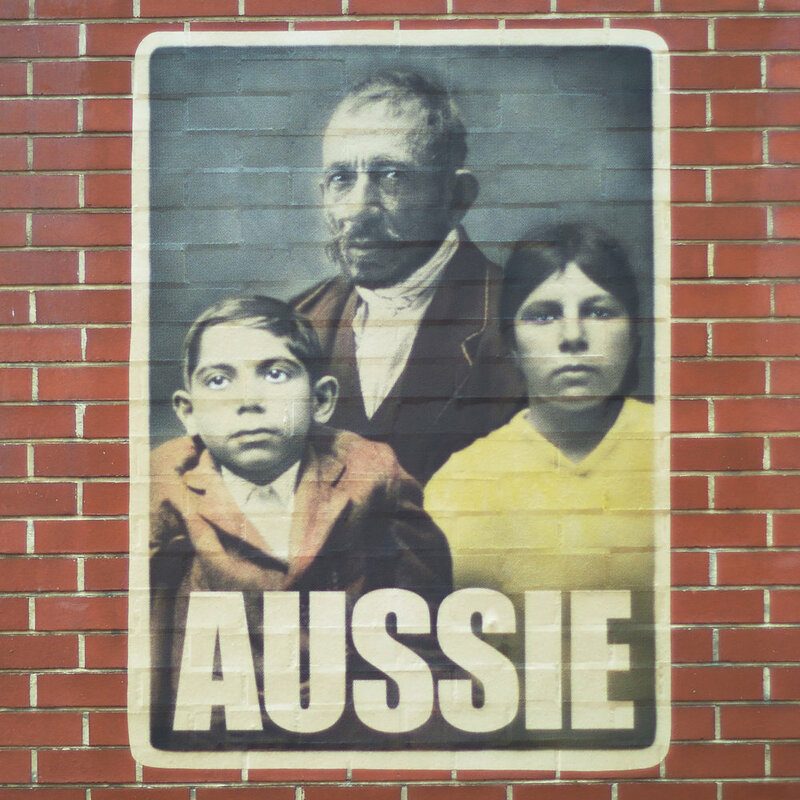 The aim of my work over the last year has been to pose a question about the casual assumptions that underlie Australia’s identity; does ‘Aussie’ describe the people who wrote the white Australia policy, or does ‘Aussie’ have more to do with the people who survived it? I see more to admire in the courage of those who chose to make Australia their home, despite the racial discrimination of its government. It’s a shift in thinking that’s very similar to something I first experience two decades ago. I was twelve years old and The Adventures of Priscilla, Queen of the Desert was on TV. As a sequined Guy Pearce pranced across the iconic Australian landscape, previously reserved for the likes of Crocodile Dundee, I could feel my assumptions crumbling. Here was the best Aussie larrikin ever put to screen, and he couldn’t be gayer. Together with Terence Stamp, Hugo Weaving, Bill Hunter and Sarah Chadwick, the film deployed a cocktail of humour, pathos and ABBA that seduced and educated Australia, and the world. What made Priscilla so clever was it’s generosity. It chose to celebrate the conquest of fear, rather than indulge in the currency of victimhood. ‘Their courage can be our courage’ it seemed to say in an offering to all Australians, and that method of persuasion has always stuck with me. Twenty two years later it all seems distinctly out of step with the character of contemporary social debate in Australia, with its hysterical fear and compulsory outrage. Beyond the fear and the shame lies the inevitable coming together, and it’s there that art has a role to play. Through boundless spirit of humour and generosity, the performers of the Broken Heel Festival carry the torch fabulously! I attended the inaugural festival last year and it’s becoming a yearly pilgrimage. There’s something very special about seeing locals get up on stage who have suddenly found the safety and courage to be themselves. Mostly it’s a lot of wigs and glitter and fun, but it can be quite emotional. There are moments at the Silverton fringe event hosted by Jimay Falcon and Sh’ Gazey when you realise that, for some locals, it’s far more than entertainment. For some, it’s their chance to be accepted. It’s the personal connections of this kind that motivate all artists. For me those rewards came from meeting The Shamroze family, decedents of the Cameleer Shamroze Khan. At the Afghan Mosque, a very small building built in 1891 and now a museum where visitors sometimes worship, Randal Shamroze explained to me how his Australian-ness is occasionally thrown into question, even today. “I just tell them I’m a descendent of the Australian Cameleers” he says with a quiet pride that would give pause to the Pauline Hansons of this world, if only they were listening. I left Broken Hill with a sense of optimism that’s hard to find in the city. Having launched my balloon carrying posters of the Khalik family, I felt as though I’d made a quiet statement of my own. Watching the balloon disappear into the sky I quickly realised that all that space never ends, and just as quickly realised it was time to go home. A few sources of inspiration from Australian films.